Finally.... I managed to finish this quilt top that I started rather a number of weeks ago (actually almost months) together with Lynn and lots of others who joined in Lynn's QAL. God only knows why this one is dragging its heals. 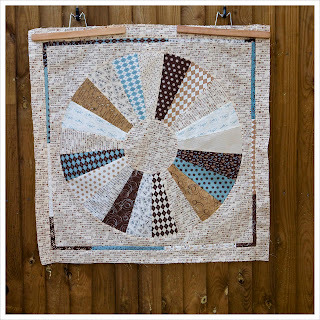 This is very much unlike me as I usually start a quilt and finish it in good time. I don't really do UFOs, they would drive me mad and this one was almost turning into one. But I have realised that I don't much like to use this pattern in a repeat on an entire quilt. 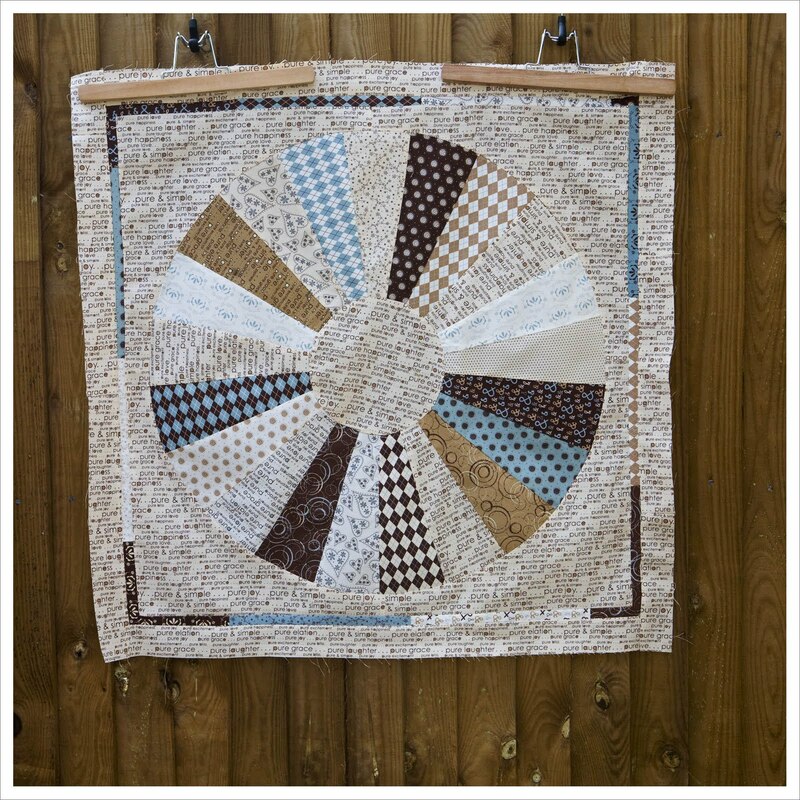 I can't really put my finger on it but I think the single Dresden looks perfect to me and if it wasn't for the fact that I had cut all fabric for the remaining 3 Dresdens I would have left it as a single perfect mini quilt. 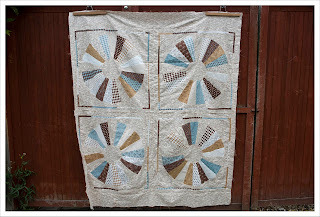 The reason why I joined the QAL was actually Lynn's perfect Sherbet Pip Dresden mini quilt. 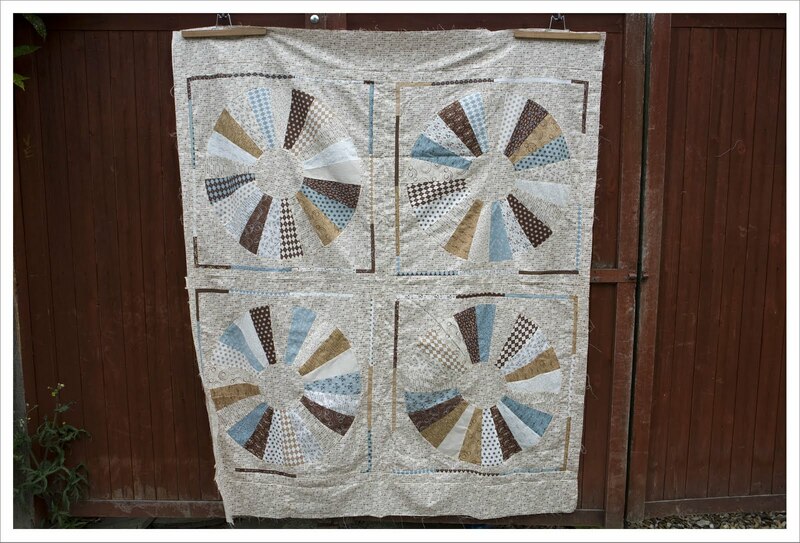 Whereas with the Single Girl quilt for example I felt the opposite way and thought that one single ring looked lost. I don't think there is a reasonable explanation for this. It is just personal taste. But I still think that my 'Laugh and Happiness' quilt has turned out to be a really elegant quilt top and I have my mother in mind as recipient because these are all her colours. I added a border at the top and bottom to stretch it a bit because this will make it easier to snuggle up under on the sofa (which I am hoping she will do). My mother, although a very talented knitter is not as convinced about quilts as I am and doesn't really know what to do with them. But I am determined to make her love them. Hopefully this one will do it. 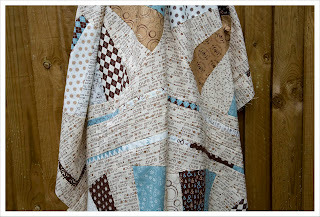 I'm loving the colors in this quilt and might also jump on and make this pattern. I have been seeing it on Lynne's blog and others who followed along. It's looking wonderful. It's interesting what you say about one dresden vs a group of dresdens - I actually kind of understand where you're coming from on that - the ingle dresden does work really well and that effect is slightly lost when it's multiplied. I also confess though that I am now madly in love with mine with six on regardless but then, unlike your Mum, I really really adore quilts and will happily sit watching tv under a whole pile of them! How could your mother not like it?! Surely this is the quilt that will convert her to the joys of snuggling under one! 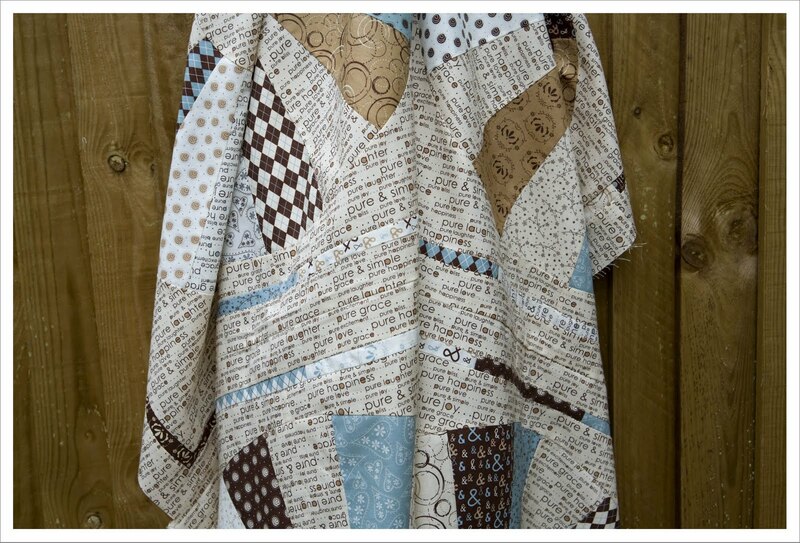 I really like your choice of colours and how's the quilt top turning out. Sure your mother will love it. Winter is never too far away! It has great movement. I like the border inside each block. Nice job. You did a wonderful job. These colors would look great either way - single or more. I love the soft look of them. It's beautiful! You have a very lucky Mum!